Home of the big telescope in Yorkshire. So if you are new to astronomy or more experienced and want to get involved, then you are most welcome to join the web site or even the Brough Astronomy Club also known as BLAS. We have amongst the best (if not *the* best!) 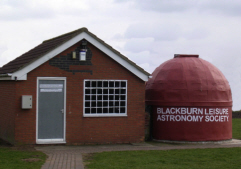 astronomy facilities in Yorkshire. This includes two domes with computer-controlled telescopes and good presentation and social facilitires in our observatory. Our main telescope is a large Meade 14" Cassegrain, and we have two fixed 80mm refractors primarily used for imaging. We have o number of carry-out portable telescopes and equipment for safe viewing of solar events. they may give the answers to some of your questions. Now that we have completed the building work we are now fitted out with surround sound and 2 projection systems to allow simultaneous projections of computer and camera displays from the telescope or the internet to be projected to an impressive screen of 12ft by 5ft. From 24th March we will be running a series of 10 sessions for beginners in astronomy - no previous knowledge required - click Beginners Sessions on the left for details.. The aim of the society is to promote all aspects of astronomy whether it is first time users trying to understand their telescope or find their way round the night sky to the more interesting aspects of the subject. We are also a "hands on" group where we will endeavor to make, fix or talk about anything even other topics that have nothing to do with astronomy. So if you are interested in astronomy, cannot get your telescope to work or understand it. Or simple got nothing to do on the fourth MONDAY of the month at 7:30 p.m. [Club night] or most Friday evenings -- COME ON DOWN where the kettle will be on - or get a beer from the club house. If you have enjoyed this site and wish to contribute. Welcome to the Brough Astronomy web site -- If you wish to become a member of this site - go to the members area & subscribe to our site, this will allow you to post your pictures, communicate with the other members, comment and be interactivity. When approved as a member to this site [approval is to ensure you are not a spammer or computer], your profile details will need to be completed which will then allow full membership privileges. New members please go to the members tab click on your icon and "edit profile"
One of the more interesting site is the NASA site and by clicking on this paragraph will take you to the live High definition camera's on the International Space Station, where it will show where on the earth is currently is. Please take a look at the "links" tab as it gives a great list of useful or interesting site that are worthy of a visit. - you may enjoy it? You don't have to be a large group for a visit as we welcome individuals and take a look through one of the BIGGEST computer controlled telescope and the only twin domes in Yorkshire.